↑ Kutsky, R.J. (1973). Handbook of Vitamins and Hormones. New York:Van Nostrand Reinhold. ↑ 3.0 3.1 Dietary Reference Intakes: Vitamins The National Academies, 2001. ↑ N/D= "Amount not determinable due to lack of data of adverse effects. 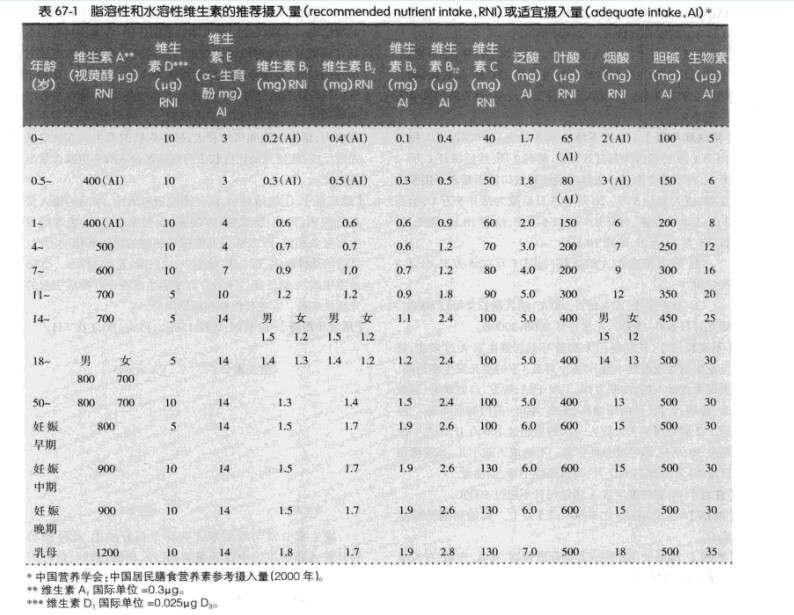 Source of intake should be from food only to prevent high levels of intake"(see Dietary Reference Intakes: Vitamins). ↑ Plain type indicates Adequate Intakes (A/I). "The AI is believed to cover the needs of all individuals, but a lack of data prevent being able to specify with confidence the percentage of individuals covered by this intake" (see Dietary Reference Intakes: Vitamins). ↑ Value represents suggested intake without adequate sunlight exposure (see Dietary Reference Intakes: Vitamins).